Don't you love this little tee shirt stamp??? I got this set from Gina K - over a year ago I think - and this is the first time I've inked it up - so you can see that I'm still working on my New Year's resolution - to USE MY STAMPS!! not just admire them on my shelves!!! I used today's sketch challenge on Split Coast for my card design and the Doubledog Dare Challenge from Joan Ervin this week was to make a Mother's Day card with an article of clothing on it. This card will be for my sister, Marcia - since we lost our dear mother, Margaret, 7 years ago (at the ripe old age of 89 - so she had a good long life! - love you mum!) and obviously the Tee shirt stamp is my article of clothing. The sentiments are Papertrey Ink from the Women of Life set. I just got my Cosmo Cricket Girl Friday paper today - so I whipped it right out to use on this card. I did a little piercing on the scalloped circle and added some bling from Amuse to the shirt - what's a T shirt without bling?!?!? LOL! You are cordially invited to join along in our Doubledog Dare weekly challenges - just use the Keyword DDC when you load your card in your Split Coast gallery. You can see all the Doubledog Dare cards here. I'm rushing off again tonight - I haven't been getting to bed until midnight the last few nights - and when you have to get up at 5:30 am for work - that's not good (!) - so I'm trying to get to bed by 10:30 tonight - we'll see if I make it! I'm catching up on the challenges today - so this card uses little bits of ribbon for the Split Coast Clean and Simple challenge and the colors red, old olive, black and cream for the color challenge. I used my new Top Note (finally caved and bought it and I LOVE IT - don't look at this card Anne Harada! - she's still resisting the purchase! LOL!) I colored the leaf with my Stampin Up Old Olive marker to get that color in as required for the challenge. The stamps are from Papertrey Ink - the leaf is from the Friends Till the End set and the sentiment is from the Tea for Two set. The big brad is solid black but there is a little glare showing on it in the picture. The top note is up on dimensionals. Short post tonight - I'm off to eat supper and then into my stamping room again - got some projects I'm working on! Thanks so much for stopping by! Wow - it's so good to be back stamping! Did you miss me???!!! Or maybe you didn't realize I was gone for a few days?!?! LOL! Well - my cards today were made with 2 purposes in mind. First- I wanted to do the Featured Stamper challenge at Splitcoast. Today's FS was Kathy (Wattle) and I chose this card of her's to case. I changed the colors (made mine feminine) and used Labels One for my framings, and made it square. I read on Amy Tsuruta 's blog about her friend Amy in Canada - who is trying to gather cards for two ladies she knows. Bea is turning 100 years old in Sept and the Mary is turning 90 in Nov and she wants to gather 100 and 90 cards respectively. So I thought I'd help her along by sending one for each lady. The card I chose today in Kathy's gallery gave me the push to get my cards done! I've had the Headline Alphabet Stamps from Stampin Up (retired) for ever - and I think I've only used them once before - so I was glad to have a reason to ink them up. And I added pearls to the corners because every young lady needs to have her pearls on for her birthday - don't you agree!?!? ETA: I thought that you could spell 90 either ninty or ninety - and I left off the 'e' for spacing issues - but in looking at it - it now seems like I should add the 'e'! what do you think? I can change it before I mail it!!! If you'd like to make cards for Bea and Mary too please send me an e-mail [email protected] and I'll be happy to e-mail you Amy's address for you to send them to. DH and I went kayaking in the surprising 80 degree weather here today! We just got our kayaks at LL Bean a couple of weeks ago and were excited to be able to use them so early in the season. We have a little river that goes through our town so we just had to travel about a mile from our house to get in a nice ride today. Here is a pic of DH Kent that I took from my kayak - I had my camera in a special waterproof bag and took the pic right through the bag! ... so it's not as clear as it would be normally - but I think it came out pretty good considering! Gosh - I'm posting so late (again!). I worked all day and then had Bible study until 8 pm - but really wanted to get my His Holy Name challenge done tonight. I used the Split Coast sketch for my 6x6 page although I turned it on it's side and moved up the front panel a bit to accomodate my verse. 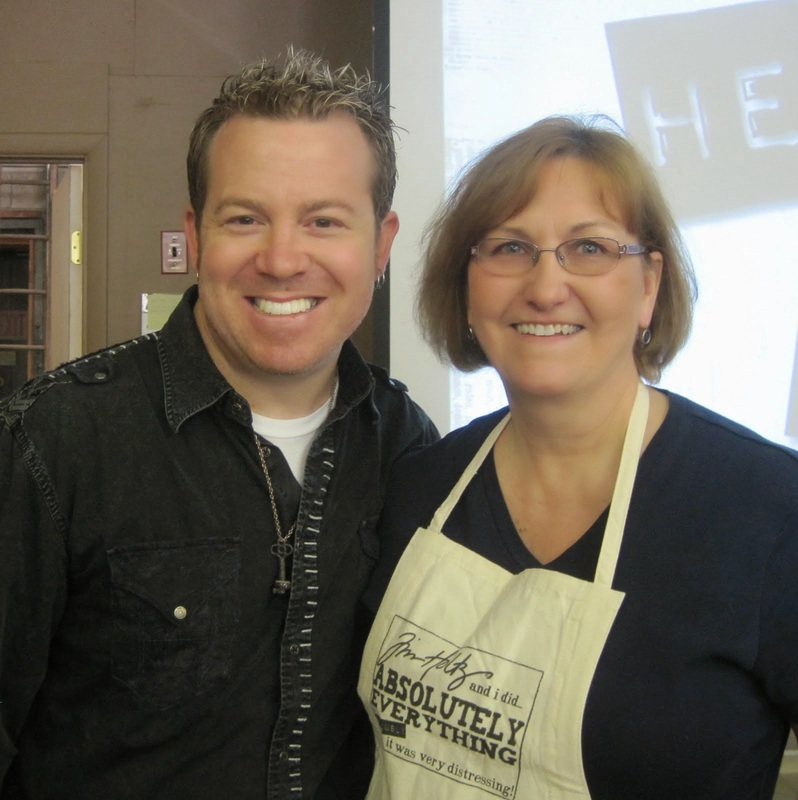 This is week 8 of the His Holy Name Challenge and God's attribute was LAMB. I used my new Green Tea Leaf designer paper's from Papertrey Ink as well as some brass ornaments (flowers, ladybug and scrolly) and a cross that I picked up last summer at the Brimfield Antiques Fair. The lamb is from the My Punny Valentine Set by PTI. I really love the part of this verse 'and God will wipe away every tear from their eyes' - John is speaking about you and me here. What a wonderful promise for us! You can join in on the His Holy Name challenge at any time - so check it out if the idea is interesting to you - Patter gives us her challenge every other Sunday. There's no deadline for getting any of them done. You just go at your own pace and you don't have to do every challenge. I've got 3 really busy days coming up so don't panic if you don't see another post here until the end of the weekend - I'm having my hair cut tomorrow night, then DH and I are going to a play on Friday night - and then I am teaching two classes at the Papertree in Manchester NH on Saturday! If you are in the NH area - come by and say hello - Michelle has an absolutely wonderful stamping store there!! As always - thanks for coming by! I was the hostess this week for the Doubledog Dare Challenge I do with a group of friends on Split Coast. 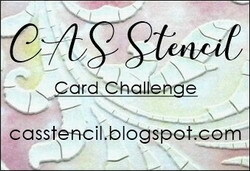 My challenge was to use this cute free Digi Image from Two Scoops Rice Designs to use on their card. Rennae has offered it free on her blog for April. I used this weeks fun MojoMonday Sketch for my card. I had to make the card big (5x5) to accomodate the size of the image. I used Art glitter on the popped up butterfly. For the back panel on the sketch - I just used a cut out Nestability scalloped square instead of a solid panel. I used Labels Four Nestability for the sentiment and an EK Success punch for the scrolly edge. I colored the image with Prismacolor markers. You can play along with our Doubledog Dare Challenges - just post your card in your Split Coast Gallery and put DDC in the keywords. You can see all the DDC cards here. Thanks so much for coming by today!! I'm off to eat my supper! Today's CAS (clean and simple) challenge on Split Coast was an inspiration challenge and Jen had us browse through the JC Penny Kids Bedding web site. My card was inspired by this kids dinosaur bedding set. Of course I had to use the Basic Grey Arcaic/Dino designer paper on this. The cute cut out dino and fun sentiment are from the Cornish Heritage Farm set called Little Boy. Both are popped up on foam dimensionals. The scrolly edge was punched with an EK Success punch. I appreciate your coming by today! This week's Featured Stamper on Split Coast was Jamie (jaymerz). She has a lot of lovely cards in her gallery! I chose this monster card of hers to CASE. And here is the card I made. I changed the stamps and colors and moved the ribbon to the side - but kept her basic design. The cupcake base is stamped on an oval cut out with my Nestability and layered to a scalloped nestability. I stamped the sprinkled frosting on a scrap of white - cut it out - and layered it over the cupcake base with foam dimensionals. I colored the sprinkles with Prismacolor markers. This cute cupcake with the sprinkles on the frosting is from the H&M Stamp Co set called Cupcake Wishes that has 4 different cupcake bases and several sentiments. The fun DP's are from the Basic Grey Cupcake Paper Pad, rather appropriate to match the cupcake don't you think?!? Accessories: Oval nestabilities, pure poppy swiss dots ribbon: PTI, small and large oval punches: SU, star brads, foam dimensionals. This weeks inspiration challenge on Split Coast was a web site store called Skeem. 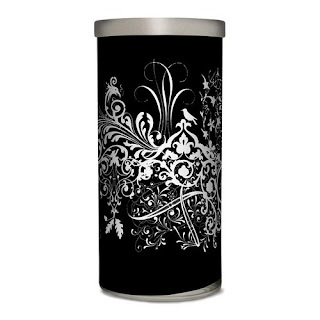 I was inspired by this tower candle. Anne (jdmommy) also Doubledog Dared our little challenge group to make a card using red, white and black so this inspiration fit that bill too - with my added red ribbon. You can join along with our Doubledog challenge - just use the keyword DDC. You can see all the Doubledog challenge cards here. Because the inspiration was clean and simple - I left the card without a sentiment or other embellishments. Inside I stamped a simple "Thanks for Your Kindness" from the Everyday Classics set from Papertrey Ink. (You cannot buy this set - you earned it free by buying 12 sets last year from PTI). Thanks for stopping by today - hope you have a lovely weekend! I'm so excited to be part of the H&M Blog Hop today! 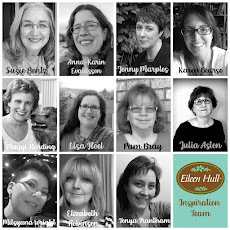 All the DT members are creating either a Mother's Day or Wedding project to inspire you! For my Mother's Day project - I decorated this lovely little oval wooden box (4 3/4 L x 3 1/2 W x 2 1/2 H) that I purchased at Michael's for $1.00 and covered with this pretty designer paper (Deja Views - Dandelion Geo). I used my Nestability Labels Four to cut the panels behind the flowers. I stamped two different flowers, cut them out and layered them, curling the edges of the top flower to give it some dimension. I added a velvet brad to the center. I glued a piece of Spring Rain (Papertrey Ink) grosgrain ribbon around the rim of the box. I love how the colors all coordinated so well! The flowers and sentiment stamps are from the gorgeous H&M stamp set designed by Debbie Corbari called Petals of Friendship. Inside I tucked a cute little pedicure set that I found at our local Five Below discount store as well as two wrapped chocolates (always need some of that right?!?!?) I figure mum should soak her feet and relax on her day and then she'll need some tools to pretty them up! Look how nicely it all fit inside here! I used the narrow rectangle, square, and Labels One Nestabilities on the card. I attached square silver brads to the ribbons. Otherwise the materials are the same as I used on the box. Now please hop on over to visit~Melissa to see what wonderful ideas she has to wow you with!! If you lose your way - all of the DT members are listed on my sidebar. Thanks so much for coming on our blog hop! Please be sure to leave comments along the way letting us know if you have been inspired by our creations! Accessories: oval wooden box: Michaels, foam dimensionals, Spring Rain grosgrain ribbon: PTI, sponge, Labels Four, Labels One, Narrow Rectangle Nesabilities, scalloped square Nestabilities, Velvet Brads: Making Memories, Rhinestone Stickers, silver square brads, glue dots,Mini Pocket Pedicure Set (Five Below), chocolates, White paper basket Shred: Michaels, Skotch Quick Dry Adhesive. This is my clean and simple (CAS) monochrome card for the challenge on Splitcoast. I used Ocean Tide with Seascape - both colors by Papertrey Ink. It is also my contribution for this weeks Doubledog Dare challenge I do with some SCS friends. Beverly (beestamper) challenged us to make a no layer card with a 'bump' (brad, button, dew drop) on it to accent the image. I just layered the image itself as my 'bump' - hope that qualifies Bev??? You can see all of the Doubledog challenge cards here. The stamp set is Warm Happiness by Papertrey Ink. Please be sure to stop by tomorrow - I'll be participating in the H&M Design Team Blog hop. The whole design team will be creating wonderful projects for Mother's Day and/or Weddings so I'm sure there will be lots of fun things to inspire you! I made this card for two challenges - the Our Creative Corner Sketch and Sharon's Stamp Simply Hang It Up challenge - to use a hanging tag or charm or stamp an image of something hanging, etc. I used some fun laundry line stamps that I've had for ages by Inkums Stamps and the sentiment is from Who's that E-girl? by My Favorite Things. I turned the OCC sketch on it's side and tilted the sentiment block to accomodate my image. I don't know about you - but I'm completely stuffed from Easter Dinner. We had a wonderful day with family and the sun was shining brightly here in New England although the temp was in the 40's with a biting wind. I was very happy with the sun though - I'm not complaining!! Todays inspiration challenge on Split Coast was the Grandin Road web site. 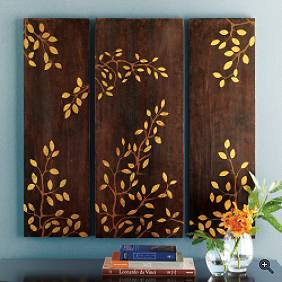 I was inspired by this botanical print I clear embossed my image on yellow card stock - and sponged all over the panel with brown ink. Then I cut the image in thirds and adhered the pieces over a blue panel. 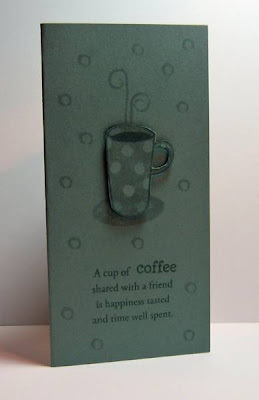 The sentiment is stamped on a Spellbinders double ended tag that is attached with foam dimensionals. I clear embossed the butterfly and attached it with a glue dot. Today I went to see the musical Dirty Dancing with my sister and two nieces - what a great show it was! The set was just super and the dancers were wonderful - I can't believe that movie came out over 20 years ago! I wish everyone a Blessed Easter and Passover Holiday! 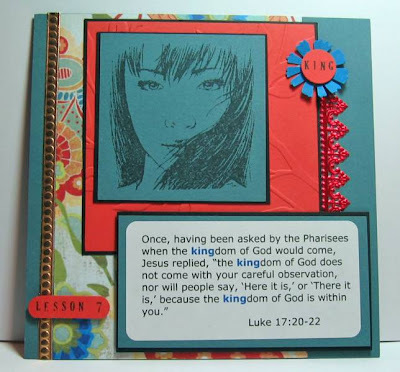 I combined 3 challenges in this project - the sketch challenge on Split Coast - making my 6x6 page for the 7th His Holy Name challenge using God's attribute of 'King', as well as the Ways to Use it Challenge - to use a label on your project (the verse is printed on an Avery Label). I chose a verse from Luke using the word Kingdom rather than King - but it spoke so powerfully to me when I found it I just had to use it. I also felt this girls face was the perfect image to illustrate the verse as soon as I saw it. I received this stamp (by Inovative Creations) in a set that I won as a door prize at the Stamp New England Weekend that I recently attended. It's wonderful when a project falls together just the way you envisioned it - that's what happened for me with this Holy Name Page. You can join along in the His Holy Name challenges at any time - check out all of Patter's info on Split Coast here. 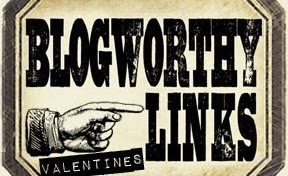 Or click on the blinky on my sidebar to get to her blog. Patter gives us a new attribute every other Sunday. You can see all of the Holy Name creations in the HHN09 Split Coast gallery here. 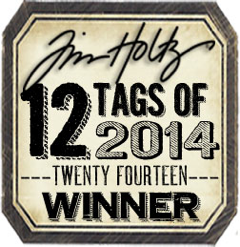 I appreciate your stopping by my blog today! Leave me a comment so I can come visit you too! Here is my card for today's color challenge on Split Coast as well as last weeks Doubledog Dare Challenge from Anne (Itsapassion) to use scrapbook sketch SBSC#31 and to include a fashion accessory - The fan is my accessory! The stamps are Hero Arts and Amuse. We'd love to have you join in on our Double Dare Challenges - just post your card on Split Coast and use keyword DDC. You can see all the Doubledog Dare Challenge cards here. Off to eat a quick supper and work on some more stamping projects! thanks for dropping by! Basically - you cut out 2 different size scallopped circles Nestabilities and then cut out the center out with a small circle. (I laid the smaller circle Nestability inside the larger scalloped circle on my cuttlebug and cut out both at the same time). You cut through one side of the scalloped circle - re-attach the ends overlapping about 3 scallops so it curves up. Cut little snips around the inside edge and bend up a little. Put glue around the inside edge and lay the small cut circle on top. Attach the smaller 'nest' over the larger 'nest' with foam dimensionals in the center so it pops up a bit. Add some shredded basket paper and your little peep and there you go! I used designer papers rather than stamped card stock on mine. You can certainly use any size circles you want - just for reference - I used the 4 1/4" scallopped circle (measuring to outside edge) with the 2 1/4" plain circle and the 3 1/2" scallopped circle with the 1 5/8" plain circle. In order to keep them clean and fresh for the sale - I placed my little nested peeps inside flat bottom bags from clearbags.com - folded over the tops - punched two slots in the bag and wove my ribbon through. I also stamped 'wishing you a happy Easter' on a tag trio and attached it along the bottom of the bag - but forgot to photo them after I added that! Papers: Amuse, Crate Paper Seaweed Collection. I used the Swiss Dots cuttlebug folder for the front panel that I also cut with my new Labels Four Nestability. The edge is punched with the fleur de lis punch by EK Success. I colored the arbor with Koh-I-Noor colour pencils and gamsol. I added a little knotted ribbon at the top. I used my hot gun on the ends to curl them a bit. 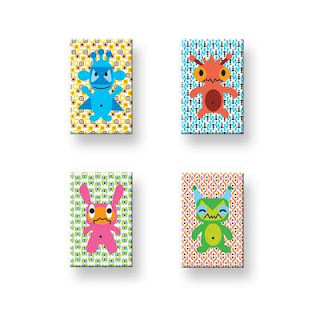 As I was looking through the Frenchbull Website for the Inspiration Challenge on Split Coast - I found these Kids Mini Notebooks and knew that my Doodle Factory Stamps would be perfect for this. I made 4 ATC's (Artist Trading Cards) for this challenge. Starting with a 2.5 x 3.5 white panel, I added the designer papers, stamped Yapples, Zot, Skoober, and Mimo on colored card stock - colored them a little with Copics and attached them with foam dimensionals. The sentiments are from Cornish Heritage Farms Little Guy set. I used the Stampin Up large oval punch. I sponged the edges of the sentiment and the cards with So Saffron Ink, punched the corners and added little gold stickers. Heather over at H&M Stamps has just released three wonderful new stamp sets - a wedding set, a cupcake set (of course!) 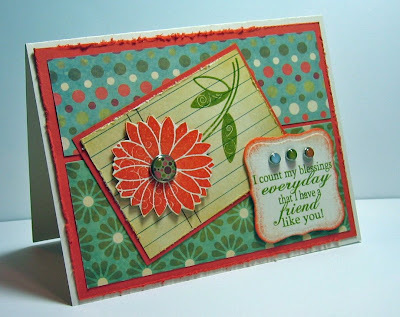 and a flower set called Petals of Friendship - which is where the stamps on this card are from. Talented designer, Debbie Corbari created this pretty set. Be sure to check them all out - they are just in time for the spring season of flowers, weddings and celebrations! You can see cards from the other H&M Design Team Members by clicking on their names on my sidebar. I used today's sketch over at Split Coast for this card and some pretty new designer paper from We R Memory Makers called Grandma's Kitchen. I got it at my local Michaels - they have just started carrying some of the popular DP's like Basic Grey - I'm SO excited! Don't you love the flower center brad I thought it coordinated so well with the designer papers - all the brads are from a Designer Glazed Brads set by Basic Grey.